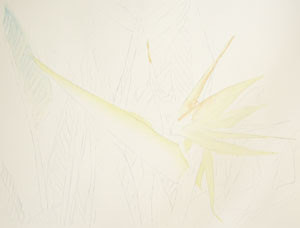 Okay, here are the first few photos of my Bird of Paradise painting in progress. 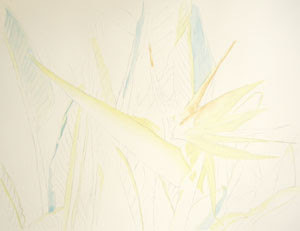 The initial photo shows the drawing which was transferred onto the Arches 300 lb watercolor paper with graphite. I added the first wash of Aurolean yellow, a touch of New Gamboge, and a tiny bit of Cadmium Orange. I also began a small wash on the leaf with some Cerulean blue, very wet. The second photo shows a bit more wash on the leaves. I have added the yellows (mentioned above) on the lighter areas and more Cerulean blue on the bluish leaves. As I study my reference photos (always use your own photos!!!!!!! 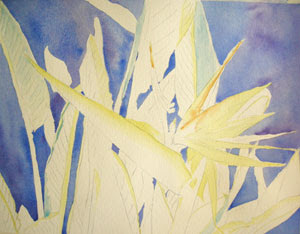 ), I noticed lots of variations of blues, greens, yellows, gold and brown on the leaves. In order to make the painting look as real as possible, I use glazes of various colors to achieve the delicate and varied colors I want to produce. The third photos shows the beginning of my background. I used a very wet wash of my favorite, French Ultramarine Blue and Ultramarine Violet. I am hoping these colors will produce a nice underglaze which will contrast with the warmer colors of the flower and the leaves. Stop back by soon to see more progress. I will try to update soon!